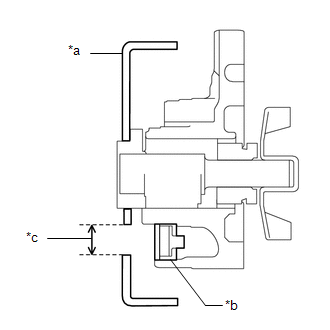 The sliding surface inside the engine water pump assembly is lubricated by engine coolant. As some engine coolant is discharged during normal operation, engine coolant residue (solids) may be found on the drain plug or the bottom of the engine water pump assembly. Also, engine coolant may leak if foreign matter enters the engine water pump assembly, however the sealing performance will recover when the foreign matter is pushed out or breaks into fine pieces. 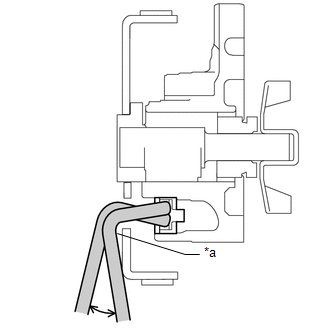 In this case, check the area around the engine water pump assembly. Before performing this inspection, check that there are no engine coolant leaks from any parts other than the engine water pump assembly. If there are leaks, inspect those areas first. Perform this inspection when the engine is cold. 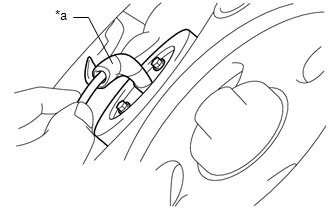 (a) Visually check the engine water pump assembly. (1) Check that engine coolant is not dripping from the engine water pump assembly. If engine coolant is dripping, replace the engine water pump assembly. If engine coolant is not dripping, perform the following check. (b) Inspect the area around the engine water pump assembly. Check for deposits around the drain plug of the engine water pump assembly. 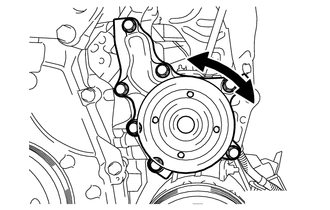 (1) Rotate the crankshaft pulley and align the water pump pulley hole with the drain plug. The drain plug is at the bottom of the engine water pump assembly. Use a mirror to check that the water pump pulley hole and drain plug are aligned. (2) Wrap a thin paper towel around an L-shaped tool such as a hexagon wrench, and insert it into the water pump pulley hole. Use a 3 mm (0.118 in.) hexagon wrench. The diameter of the water pump pulley hole is 6 mm (0.236 in.). The distance from the water pump pulley hole to the drain plug is 18 mm (0.709 in.). (3) Move the hexagon wrench as shown in the illustration, and press the paper towel against the engine coolant (solid matter) adhered to the drain plug or the edge of the drain plug, and check the condition of the paper towel. If the paper towel is wet, replace the engine water pump assembly. If the paper towel is dry, clean the area around the engine water pump assembly. (a) Remove the V-ribbed belt. (b) Turn the water pump pulley and check that the water pump bearing moves smoothly and quietly. If necessary, replace the engine water pump assembly. (c) Install the V-ribbed belt.